OMEGA high temperature jack panels feature ceramic connectors mounted in a steel plate for service temperatures up to 1000°F (537°C). 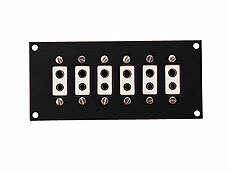 These panels with UHX connectors are ideal when glazed ceramic or nylon connector panels would contaminate a vacuum system. Below are examples of common part numbers. Use the Part Number Builder below this table to select your exact configuration. Note: All OMEGA™ NHJP jack panels are shipped unassembled, with all necessary hardware for mounting included.